In July 2017, the Vikings of Mann once again erected an authentic Viking Camp portraying life around 790 AD around the first Tynwald Day. 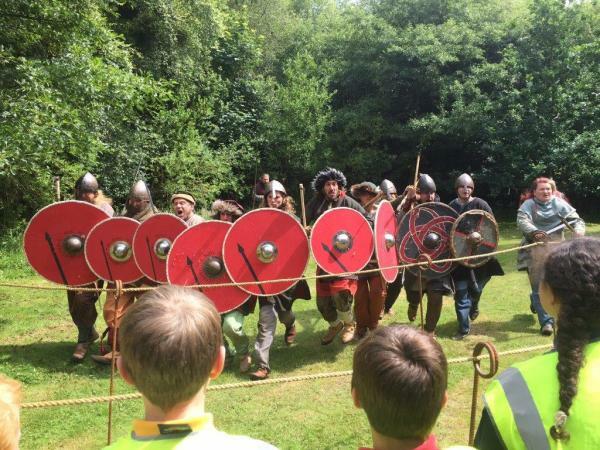 For two days prior to Tynwald Day the camp had visits from 320 school children from Arbory, St Johns, Peel Clothworkers, Braddan, Marown, Scoill Phurt le Moirrey and Bunscoill Ghaelgagh. A range of crafts was taught including local Manx crafts and traditions as well as storytelling, Viking dress and leather work, forging etc. On Tynwald Day we have a visit from the official Tynwald Party followed by over 3,000 members of the public. We also had over 20 Viking re-enactors coming over to the Island to take part. More photos can be found by clicking on the link.